Hc Verma i Solutions for Class 11 Science Physics Chapter 8 Work And Energy are provided here with simple step-by-step explanations. These solutions for Work And Energy are extremely popular among class 11 Science students for Physics Work And Energy Solutions come handy for quickly completing your homework and preparing for exams. All questions and answers from the Hc Verma i Book of class 11 Science Physics Chapter 8 are provided here for you for free. You will also love the ad-free experience on Meritnation’s Hc Verma i Solutions. All Hc Verma i Solutions for class 11 Science Physics are prepared by experts and are 100% accurate. When you lift a box from the floor and put it on an almirah the potential energy of the box increases, but there is no change in its kinetic energy. Is it a violation of conservation of energy? No. Work done in lifting the box increases the potential energy of the box. During lifting at every point, the force applied by us on the box in the upward direction is equal to the gravitational force acting on the box in the downward direction. Therefore, there is no change in the velocity of the box. As a result, the kinetic energy of the box will not change. A particle is released from the top of an incline of height h. Does the kinetic energy of the particle at the bottom of the incline depend on the angle of incline? Do you need any more information to answer this question in Yes or No? No, the kinetic energy of the particle at the bottom of the inclined plane does not depend on the angle of inclination. When the particle reaches the ground, all its potential energy, while at the top of the inclined plane, is converted into kinetic energy. As we know that kinetic energy depends only on the height of the particle, it will be the same for different angles of inclination. No, we do not need any other information to answer this question. Can the work by kinetic friction on an object be positive? Zero? Yes. Let us consider a block A which is resting on another block B. Block B is resting on a smooth horizontal surface. Let the coefficient of friction between the blocks be μ. When a force F is applied on block B in the forward direction as shown in the above figure, block A moves with block B in the direction of the applied force. The frictional force on block A and the displacement will be in the forward direction. Therefore, work done by the frictional force is positive. If we consider the reference frame of block B, then displacement of block A will be zero. Therefore, work done by the frictional force is zero. Can static friction do nonzero work on an object? If yes, give an example. If no, give reason. Yes. Let us consider a block A which is resting on another block B. Block B is resting on a smooth horizontal surface. Let the coefficient of kinetic friction between the blocks be μk. When a force F is applied on block B in the forward direction as shown in the above figure, block A moves with block B in the direction of the applied force. The friction force on block A and the displacement will be in the forward direction. Therefore, work done by the friction force is positive. In this case, block A will remain in contact with block B. This shows that static friction is doing a nonzero work on an object. Can normal force do nonzero work on an object? If yes, give an example. If no, give reason. Yes. Let us consider an elevator accelerating upward with a body placed in it. In this case, the normal reaction offered by the floor of the elevator on the body is greater than the weight of the body acting in the downward direction. If a person is observing this from the ground, then, for him, the normal reaction is doing a positive work, as the elevator is moving upward. Can kinetic energy of a system be increased without applying any external force on the system? Yes. Let us consider an isolated system of two particles falling towards each other under their mutual gravitational force of attraction. Here, the net force on the system is zero, but the velocities of the particles keep on increasing. Also, the kinetic energy of the system is increased without applying any external force on it. Is work-energy theorem valid in non-inertial frames? In an non-inertial frame, pseudo force also comes into account. As we know that pseudo force does not exist, work-energy theorem is not valid in non-inertial frames. A heavy box is kept on a smooth inclined plane and is pushed up by a force F acting parallel to the plane. Does the work done by the force F as the box goes from A to B depend on how fast the box was moving at A and B? Does the work by the force of gravity depend on this? (i) No. As the surface is smooth and the friction is zero, work done by the force will only depend on the force and the displacement. (ii) No, because gravitational force is a conservative force and work done by a conservative force will depend only on the force and the displacement. One person says that the potential energy of a particular book kept in an almirah is 20 J and the other says it is 30 J. One of them necessarily wrong? No, both are correct. We measure potential energy from a reference level chosen by the observer. Therefore, in this case, both observers are measuring the potential energy from different reference levels. A book is lifted from the floor and is kept in an almirah. One person says that the potential energy of the book is increased by 20 J and the other says it is increased by 30 J. Is one of them necessarily wrong? Yes, one of them is necessarily wrong. We measure potential energy from a reference level chosen by the observer. However, the change in potential energy of a body does not depend on the level of reference. In one of the exercises to strengthen the wrist and fingers, a person squeezes and releases a soft rubber ball. Is the work done on the ball positive, negative or zero during compression? During expansion? (i) During compression, the work done on the ball is positive as the direction of the force applied by the fingers is along the compression of the ball. (ii) During expansion, the work done is negative as expansion takes place against the force applied by the fingers on the ball. In tug of war, the team that exerts a larger tangential force on the ground wins. Consider the period in which a team is dragging the opposite team by applying a larger tangential force on the ground. List which of the following works are positive, which are negative and which are zero? (e) total external work on the two teams. (a) Work by the winning team on the losing team is positive, as the displacement of the losing team is along the force applied by the winning team. (b) Work by the losing team on the winning team is negative, as the displacement of the winning team is opposite to the force applied by losing team. (c) Work by the ground on the winning team is positive. (d) Work by the ground on the losing team is negative. (e) Total external work on the two teams is positive. When an apple falls from a tree what happens to its gravitational potential energy just as it reaches the ground? After it strikes the ground? When an apple falls from a tree, its gravitational potential energy decreases as it reaches the ground. After it strikes the ground, its potential energy will remain unchanged. When you push your bicycle up on an inclined plane, the potential energy of the bicycle and yourself increases. Where does this energy come from? When a person pushes his bicycle up on an inclined plane, the potential energies of the bicycle and the person increase because moving up on the inclined plane the kinetic energy decreases. and as mechanical energy is sum of kinetic energy and potential energy, and remains constant for a conservative system. Therefore, potential energy must increase in this case. The magnetic force on a charged particle is always perpendicular to its velocity. Can the magnetic force change the velocity of the particles? Speed of the particle? The magnetic force on a charged particle is always perpendicular to its velocity. Therefore, the work done by the magnetic force on the charged particle is zero. Here, the kinetic energy and speed of the particle remain unaffected, while the velocity changes due to the change in direction of its motion. A ball is given a speed v on a rough horizontal surface. The ball travels through a distance l on the surface and stops. (a) what are the initial and final kinetic energies of the ball? (b) What is the work done by the kinetic friction? Here, m is the mass of the ball. The final kinetic of the ball is zero. Work done by the kinetic friction is equal to the change in kinetic energy of the ball. Consider the situation of the previous question from a frame moving with a speed v0 parallel to the initial velocity of the block. (a) What are the initial and final kinetic energies? (b) What is the work done by the kinetic friction? The relative velocity of the ball w.r.t. the moving frame is given by vr=v-v0. (d) may be smaller than the speed of projection. Consider that the stone is projected with initial speed v.
As the stone is falls under the gravitational force, which is a conservative force, the total energy of the stone remains the same at every point during its motion. From the above expression, we can say that the maximum speed with which the stone hits the ground depends on the speed of projection and greater than it. (d) only if elastic force alone acts on it. According to the work-energy theorem, the total work done on a particle is equal to the change in kinetic energy of the particle. The work done by the spring on both the masses is equal to the negative of the increase in the elastic potential energy of the spring. The elastic potential energy of the spring is given by Ep=12kx2. The negative of the work done by the conservative internal forces on a system is equal to the changes in potential energy. When work is done by an external forces on a system, the total energy of the system will change. The work done by all the forces (external and internal) on a system is equal to the change in the total energy. The potential energy of a two particle system depends only on the separation between the particles. The block is not sliding on the wedge. The net force on the block is not zero, therefore the block will not be in any given equilibrium. Suppose that one end of an extensible string is attached to a mass m, while the other end is fixed. The mass moves with a velocity v in a vertical circle of radius R. At some instant, the string makes an angle θ with the vertical as shown in the figure. For a complete circle, the minimum velocity at L must be vL=5gl. A box is pushed through 4.0 m across a floor offering 100 N resistance. How much work is done by the resisting force? A block of mass 5.0 kg slides down an incline of inclination 30° and length 10 m. Find the work done by the force of gravity. Work done by the force of gravity depends only on the height of the object, not on the path length covered by the object. A constant force of 2⋅5 N accelerates a stationary particle of mass 15 g through a displacement of 2⋅5 m. Find the work done and the average power delivered. A particle moves from a point →r1=2 m →i+3 m →j to another point →r2= 3 m →i+2 m →j acts on it. Find the work done by the force on the particle during the displacement. A man moves on a straight horizontal road with a block of mass 2 kg in his hand. If he covers a distance of 40 m with an acceleration of 0⋅5 m/s2, find the work done by the man on the block during the motion. The kinetic energy force on the particle continuously increases with time. (a) The resultant force on the particle must be parallel to the velocity at all instants. (b) The resultant force on the particle must be at an angle less than 90° all the time. (c) Its height above the ground level must continuously decrease. (d) The magnitude of its linear momentum is increasing continuously. (b) The resultant force on the particle must be at an angle less than 90° with the velocity all the time. Kinetic energy of a particle is directly proportional to the square of its velocity. The resultant force on the particle must be at an angle less than 90° with the velocity all the time so that the velocity or kinetic energy of the particle keeps on increasing. The kinetic energy is also directly proportional to the square of its momentum, therefore it continuously increases with the increase in momentum of the particle. (d) it was initially in its natural length and finally in a stretched position. For an elastic spring, the work done is equal to the negative of the change in its potential energy. A block of mass M is hanging over a smooth and light pulley through a light string. T he other end of the string is pulled by a constant force F. The kinetic energy of the block increases by 20 J in 1 s.
(a) The tension in the string is Mg.
(b) The tension in the string is F.
(c) The work one by the tension on the block is 20 J in the above 1 s.
(d) The work done by the force of gravity is −20 J in the above 1 s.
Tension in the string is equal to F, as tension on both sides of a frictionless and massless pulley is the same. So, the tension in the string cannot be equal to Mg. The change in kinetic energy of the block is equal to the work done by gravity. Hence, the work done by gravity is 20 J in 1 s, while the the work done by the tension force is zero. The mass of a cyclist together with the bike is 90 kg. Calculate the increase in kinetic energy if the speed increases from 6⋅0 km/h to 12 km/h. A block of mass 2.00 kg moving at a speed of 10.0 m/s accelerates at 3.00 m/s2 for 5.00 s. Compute its final kinetic energy. A force F=α+bx acts on a particle in the x-direction, where a and b are constants. Find the work done by this force during a displacement from x = 0 to x = d.
A block of mass 250 g slides down an incline of inclination 37° with uniform speed. Find the work done against friction as the block slides through 1m. Here, R is the normal reaction of the block. 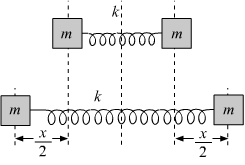 A block of mass m is kept over another block of mass M and the system rests on a horizontal surface (figure 8-E1). A constant horizontal force F acting on the lower block produces an acceleration F2 m+M in the system, and the two blocks always move together. (a) Find the coefficient of kinetic friction between the bigger block and the horizontal surface. (b) Find the frictional force acting on the smaller block. (c) Find the work done by the force of friction on the smaller block by the bigger block during a displacement d of the system. A box weighing 2000 N is to be slowly slid through 20 m on a straight track with friction coefficient 0⋅2 with the box. (a) Find the work done by the person pulling the box with a chain at an angle θ with the horizontal. (b) Find the work when the person has chosen a value of θ, which ensures him the minimum magnitude of the force. A block of weight 100 N is slowly moved up a smooth incline of inclination 37° by a person. Calculate the work done by the person in moving the block through a distance of 2 m, if the driving force is (a) parallel to the incline and (b) in the horizontal direction. Find the average frictional force needed to stop a car weighing 500 kg at a distance of 25 m if the initial speed is 72 km/h. Find the average force needed to accelerate a car weighing 500 kg from rest to 72 km/h through a distance of 25 m.
A particle of mass m moves on a straight line with its velocity varying with the distance travelled, according to the equation ν=ax, where a is a constant. Find the total work done by all the forces during a displacement from x=0 to x-d.
A block of mass 2 kg kept at rest on an inclined plane of inclination 37° is pulled up the plane by applying a constant force of 20 N parallel to the incline. The force acts for one second. (a) Show that the work done by the applied force does not exceed 40 J. (b) Find the work done by the force of gravity in that one second if the work done by the applied force is 40 J. (c) Find the kinetic energy of the block at the instant the force ceases to act. Take g = 10 m/s2. A 250 g block slides on a rough horizontal table. Find the work done by the frictional force in bringing the block to rest if it is initially moving at a speed of 40 cm/s. If the friction coefficient between the table and the block is 0⋅1, how far does the block move before coming to rest? Force in the forward direction is equal to the friction force. Water falling from a 50-m high fall is to be used for generating electric energy. If 1·8×105 kg of water falls per hour and half the gravitational potential energy can be converted into electrical energy, how many 100 W lamps can be lit with the generated energy? A person is painting the walls of his house. He stands on a ladder with a bucket containing paint in one hand and a brush in the other. Suddenly the bucket slips from his hand and falls to the floor. If the bucket with the paint had a mass of 6 kg and was at a height of 2 m at the time it slipped, how much gravitational potential energy was lost together with the paint? A projectile is fired from the top of a 40 m high cliff with an initial speed of 50 m/s at an unknown angle. Find its speed when it hits the ground. Let the projectile hit the ground with velocity 'v'. The projectile hits the ground with a speed of 58 m/s. The 200 m free-style women's swimming gold medal at Seoul Olympics in 1988 was won by Heike Friendrich of East Germany when she set a new Olympic record of 1 minute and 57⋅56 seconds. Assume that she covered most of the distance with a uniform speed and had to exert 460 W to maintain her speed. Calculate the average force of resistance offered by the water. ∴ Resistance force offered by the water during the swim is 270 N.
The US athlete Florence Griffith-Joyner won the 100 m sprint gold medal at Seoul Olympics in 1988, setting a new Olympic record of 10⋅54 s. Assume that she achieved her maximum speed in a very short time and then ran the race with that speed till she crossed the line. Take her mass to be 50 kg. (a) Calculate the kinetic energy of Griffith-Joyner at her full speed. (b) Assuming that the track, wind etc. offered an average resistance of one-tenth of her weight, calculate the work done by the resistance during the run. (c) What power Griffith-Joyner had to exert to maintain uniform speed? 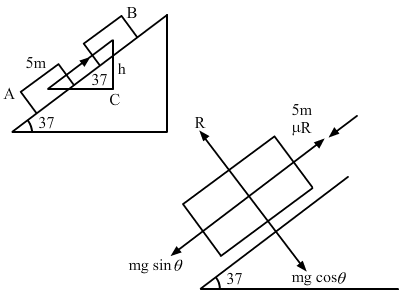 The motion can be assumed to be uniform. To maintain uniform speed, she had to exert 4900 J of energy to overcome friction. A water pump lifts water from 10 m below the ground. Water is pumped at a rate of 30 kg/minute with negligible velocity. Calculate the minimum horsepower that the engine should have to do this. An unruly demonstrator lifts a stone of mass 200 g from the ground and throws it at his opponent. At the time of projection, the stone is 150 cm above the ground and has a speed of 3 m/s. Calculate the work done by the demonstrator during the process. If it takes one second for the demonstrator to lift the stone and throw it, what horsepower does he use? Therefore, power used by the demonstrator to lift and throw the stone is 5.14×10-3 hp. In a factory, 2000 kg of metal needs to be lifted by an engine through a distance of 12 m in 1 minute. Find the minimum horsepower of the engine to be used. Check the validity of these specifications. As the scooter can reach a maximum of 8.2 m/s while producing a force of 950/3 N, the specifications given are not correct. A block of mass 30 kg is being brought down by a chain. If the block acquires a speed of 40 cm/s in dropping down 2 m, find the work done by the chain during the process. Let a be the acceleration of the block in the downward direction. The heavier block in an Atwood machine has mass twice that of the lighter one. The tension in the string is 16⋅0 N when the system is set into motion. Find the decrease in the gravitational potential energy during the first second after the system is released from rest. The two blocks in an Atwood machine have masses 2 kg and 3 kg. Find the work done by gravity during the fourth second after the system is released from rest. Consider the situation shown in the figure (8-E2). The system is released from rest and the block of mass 1kg is found to have a speed 0⋅3 m/s after it has descended a distance of 1 m. Find the coefficient of kinetic friction between the block and the table. So, the coefficient of kinetic friction between the block and the table is 0.12 . A block of mass 100 g is moved with a speed of 5⋅0 m/s at the highest point in a closed circular tube of radius 10 cm kept in a vertical plane. The cross-section of the tube is such that the block just fits in it. The block makes several oscillations inside the tube and finally stops at the lowest point. Find the work done by the tube on the block during the process. So, the work done by the tube on the body is 1.45 joule. A car weighing 1400 kg is moving at a speed of 54 km/h up a hill when the motor stops. If it is just able to reach the destination which is at a height of 10 m above the point, calculate the work done against friction (negative of the work done by friction). So, work done against friction is 20,300 joule. A small block of mass 200 g is kept at the top of a frictionless incline which is 10 m long and 3⋅2 m high. How much work was required (a) to lift the block from the ground and put it an the top, (b) to slide the block up the incline? What will be the speed of the block when it reaches the ground if (c) it falls off the incline and drops vertically to the ground (d) it slides down the incline? Take g = 10 m/s2. Let final velocity be v when the block falls to the ground vertically. Let ν be the final velocity of the block when it reaches the ground by sliding. In a children's park, there is a slide which has a total length of 10 m and a height of 8⋅0 m (figure 8-E3). A vertical ladder is provided to reach the top. A boy weighing 200 N climbs up the ladder to the top of the slide and slides down to the ground. The average friction offered by the slide is three tenth of his weight. Find (a) the work done by the ladder on the boy as he goes up; (b) the work done by the slide on the boy as he comes down. Neglect any work done by forces inside the body of the boy. (a) Work done by the ladder on the boy is zero, as work is done by the boy himself while going up. Figure (8-E4) shows a particle sliding on a frictionless track which terminates in a straight horizontal section. If the particle starts slipping from point A, how far away from the track will the particle hit the ground? Let v be the velocity of the particle at the end point on the track. So, the particle will hit the ground at a horizontal distance of 1 m from the other end of the track. A block weighing 10 N travels down a smooth curved track AB joined to a rough horizontal surface (figure 8-E5). The rough surface has a friction coefficient of 0⋅20 with the block. If the block starts slipping on the track from a point 1⋅0 m above the horizontal surface, how far will it move on the rough surface? So, the K.E. is used to overcome friction. The block stops after covering 5 m on the rough surface. 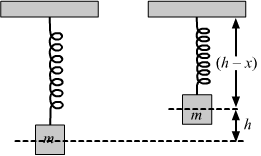 A uniform chain of mass m and length l overhangs a table with its two third part on the table. Find the work to be done by a person to put the hanging part back on the table. Let 'dx' be the length of an element at distance x from the table. The work to be done by a person to put the hanging part back on the table is mgl18. 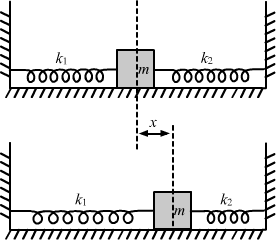 A uniform chain of length L and mass M overhangs a horizontal table with its two third part on the table. The friction coefficient between the table and the chain is μ. Find the work done by friction during the period the chain slips off the table. Let x length of the chain be on the table at a particular instant. Consider a small element of length 'dx' and mass 'dm' on the table. The total work done by friction during the period the chain slips off the table is -2μMgL9. A block of mass 1 kg is placed at point A of a rough track shown in figure (8-E6). If slightly pushed towards right, it stops at point B of the track. Calculate the work done by the frictional force on the block during its transit from A to B. The work done by the frictional force on the block during its transit from A to B is -2 joule. A block of mass 5 kg is suspended from the end of a vertical spring which is stretched by 10 cm under the load of the block. The block is given a sharp impulse from below, so that it acquires an upward speed of 2⋅ m/s. How high will it rise? Take g = 10 m/s2. A block of mass 250 g is kept on a vertical spring of spring constant 100 N/m fixed from below. The spring is now compressed 10 cm shorter than its natural length and the system is released from this position. How high does the block rise? Take g = 10 m/s2. Let the block rises to height h.
Applying law of conservation of energy which says that the total energy should always remain conserved. So, the block rises to 20 cm. Figure (8-E7) shows a spring fixed at the bottom end of an incline of inclination 37°. A small block of mass 2 kg starts slipping down the incline from a point 4⋅8 m away from the spring. The block compresses the spring by 20 cm, stops momentarily and then rebounds through a distance of 1 m up the incline. Find (a) the friction coefficient between the plane and the block and (b) the spring constant of the spring. Take g = 10 m/s2. 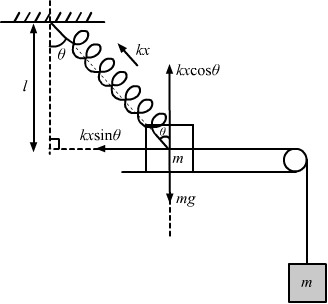 A block of mass m moving at a speed ν compresses a spring through a distance x before its speed is halved. Find the spring constant of the spring. Let the velocity of the body at P be ν. So, the velocity of the body at Q is ν2. Consider the situation shown in figure (8-E8). Initially the spring is unstretched when the system is released from rest. Assuming no friction in the pulley, find the maximum elongation of the spring. 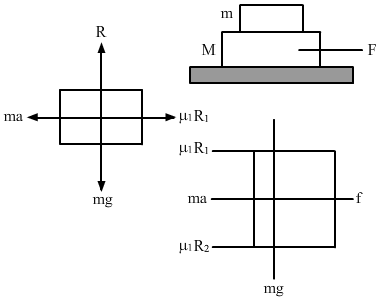 Mass of the body is m.
Let the elongation in the spring be x.
,A block of mass m is attached to two unstretched springs of spring constants k1 and k2 as shown in the figure (8-E9). The block is displaced towards the right through a distance x and is released. Find the speed of the block as it passes through the mean position shown. The body is displaced x towards the right. Let v be the velocity of the body at its mean position. A block of mass m sliding on a smooth horizontal surface with a velocity ν→ meets a long horizontal spring fixed at one end and with spring constant k, as shown in figure (8-E10). Find the maximum compression of the spring. Will the velocity of the block be the same as ν→ when it comes back to the original position shown? Let the compression in the spring be x.
maximum compression in the spring will be produced when the block comes to rest . so change in kinetic energy of the block due to change in its velocity from u m/s to 0 will be equal to the gain in potential energy of the spring. (b) No. The velocity of the block will not be same when it comes back to the original position. It will be in the opposite direction and the magnitude will be the same if we neglect all losses due friction and spring to be perfectly elastic. A small block of mass 100 g is pressed against a horizontal spring fixed at one end to compress the spring through 5 cm (figure 8-E11). The spring constant is 100 N/m. When released, the block moves horizontally till it leaves the spring. Where will it hit the ground 2 m below the spring? Let v be the velocity of the block when it leaves the spring. Therefore, the block hits the ground at 1 m from the free end of the spring in the horizontal direction. A small heavy block is attached to the lower end of a light rod of length l which can be rotated about its clamped upper end. What minimum horizontal velocity should the block be given so that it moves in a complete vertical circle? Let the velocity of the body at L is 'ν' . If the body is moving in a vertical plane then we need to find the minimum horizontal velocity which needs to be given to the body (velocity at L). Also as point H is the highest point in the vertical plane so horizontal velocity at H will be zero. Figure (8-E12) shows two blocks A and B, each of mass of 320 g connected by a light string passing over a smooth light pulley. The horizontal surface on which the block A can slide is smooth. Block A is attached to a spring of spring constant 40 N/m whose other end is fixed to a support 40 cm above the horizontal surface. Initially, the spring is vertical and unstretched when the system is released to move. Find the velocity of the block A at the instant it breaks off the surface below it. Take g = 10 m/s2. As, when the block breaks of the surface below it (i.e. gets dettached from the surface) then R =0. Let the velocity of body B be ν. One end of a spring of natural length h and spring constant k is fixed at the ground and the other is fitted with a smooth ring of mass m which is allowed to slide on a horizontal rod fixed at a height h (figure 8-E13). Initially, the spring makes an angle of 37° with the vertical when the system is released from rest. Find the speed of the ring when the spring becomes vertical. Let the velocity be 'ν'. Figure (8-E14) shows a light rod of length l rigidly attached to a small heavy block at one end and a hook at the other end. The system is released from rest with the rod in a horizontal position. There is a fixed smooth ring at a depth h below the initial position of the hook and the hook gets into the ring as it reaches there. What should be the minimum value of h so that the block moves in a complete circle about the ring? Let v be the minimum velocity required to complete a circle about the ring. Let the rod be released from a height h.
The bob of a pendulum at rest is given a sharp hit to impart a horizontal velocity 10 gl, where l is the length of the pendulum. Find the tension in the string when (a) the string is horizontal, (b) the bob is at its highest point and (c) the string makes an angle of 60° with the upward vertical. (a) Let the velocity at B be v1. (b) Let the velocity at C be v2. (c) Let the velocity at point D be ν4. A simple pendulum consists of a 50 cm long string connected to a 100 g ball. The ball is pulled aside so that the string makes an angle of 37° with the vertical and is then released. Find the tension in the string when the bob is at its lowest position. Figure (8-E15) shows a smooth track, a part of which is a circle of radius R. A block of mass m is pushed against a spring of spring constant k fixed at the left end and is then released. Find the initial compression of the spring so that the block presses the track with a force mg when it reaches the point P, where the radius of the track is horizontal. The bob of a stationary pendulum is given a sharp hit to impart it a horizontal speed of 3 gl. Find the angle rotated by the string before it becomes slack. Suppose the string becomes slack at point P.
Let the bob rise to a height h.
A heavy particle is suspended by a 1⋅5 m long string. It is given a horizontal velocity of 57 m/s. (a) Find the angle made by the string with the upward vertical when it becomes slack. (b) Find the speed of the particle at this instant. (c) Find the maximum height reached by the particle over the point of suspension. Take g = 10 m/s2. (c) As the string becomes slack at point P, the particle will start executing a projectile motion. A simple pendulum of length L with a bob of mass m is deflected from its rest position by an angle θ and released (figure 8-E16). The string hits a peg which is fixed at a distance x below the point of suspension and the bob starts going in a circle centred at the peg. (a) Assuming that initially the bob has a height less than the peg, show that the maximum height reached by the bob equals its initial height. (b) If the pendulum is released with θ=90° and x=L/2, find the maximum height reached by the bob above its lowest position before the string becomes slack. (c) Find the minimum value of x/L for which the bob goes in a complete circle about the peg when the pendulum is released from θ=90°. So, the maximum height reached by the bob is equal to the initial height of the bob. Let the string become slack at point C, so the particle will start making a projectile motion. To find highest position C1 upto which the bob can go before the string becomes slack. (as we have found out the value of α so now we want to find the distance of the highest point upto which the bob goes before the string becomes slack,using this value of α.
g L-x=2g 2x-L⇒L-x=4x-2L⇒5x=3L∴ xL=35=0.6So, the minimum value of xL shoule be 0.6. A particle slides on the surface of a fixed smooth sphere starting from the topmost point. Find the angle rotated by the radius through the particle, when it leaves contact with the sphere. Let the velocity be ν when the body leaves the surface. A particle of mass m is kept on a fixed, smooth sphere of radius R at a position where the radius through the particle makes an angle of 30° with the vertical. The particle is released from this position. (a) What is the force exerted by the sphere on the particle just after the release? (b) Find the distance travelled by the particle before it loses contact with the sphere. 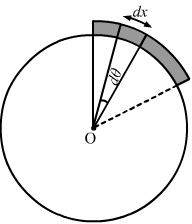 (a) When the particle is released from rest, the centrifugal force is zero. Consider that the particle loses contact with the surface at a point whose angle with the horizontal is θ. A particle of mass m is kept on the top of a smooth sphere of radius R. It is given a sharp impulse which imparts it a horizontal speed ν. (a) Find the normal force between the sphere and the particle just after the impulse. (b) What should be the minimum value of v for which the particle does not slip on the sphere? (c) Assuming the velocity v to be half the minimum calculated in part, (b) find the angle made by the radius through the particle with the vertical when it leaves the sphere. (b) When the particle is given maximum velocity, so that the centrifugal force balances the weight, the particle does not slip on the sphere. Let the velocity be ν2 when it loses contact with the surface, as shown below. Figure (8-E17) shows a smooth track which consists of a straight inclined part of length l joining smoothly with the circular part. 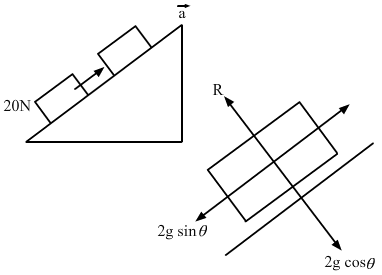 A particle of mass m is projected up the incline from its bottom. (a) Find the minimum projection-speed ν0 for which the particle reaches the top of the track. 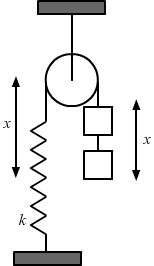 (b) Assuming that the projection-speed is 2ν0 and that the block does not lose contact with the track before reaching its top, find the force acting on it when it reaches the top. (c) Assuming that the projection-speed is only slightly greater than ν0, where will the block lose contact with the track? Let the velocity at C be ν0. (c) Let the loose contact after making an angle θ. A chain of length l and mass m lies on the surface of a smooth sphere of radius R > l with one end tied to the top of the sphere. (a) Find the gravitational potential energy of the chain with reference level at the centre of the sphere. (b) Suppose the chain is released and slides down the sphere. Find the kinetic energy of the chain, when it has slid through an angle θ. (c) Find the tangential acceleration dνdt of the chain when the chain starts sliding down. Let us consider a small element, which makes angle 'dθ' at the centre. A smooth sphere of radius R is made to translate in a straight line with a constant acceleration a. A particle kept on the top of the sphere is released at zero velocity with respect to the sphere. Find the speed of the particle with respect to the sphere as a function of the angle θ it slides. Let m be the mass of the particle. The particle 'm' will also experience inertia due to acceleration 'a' as it is in the sphere. It will also experience the tangential inertia force mdνdt and centrifugal force mν2R.